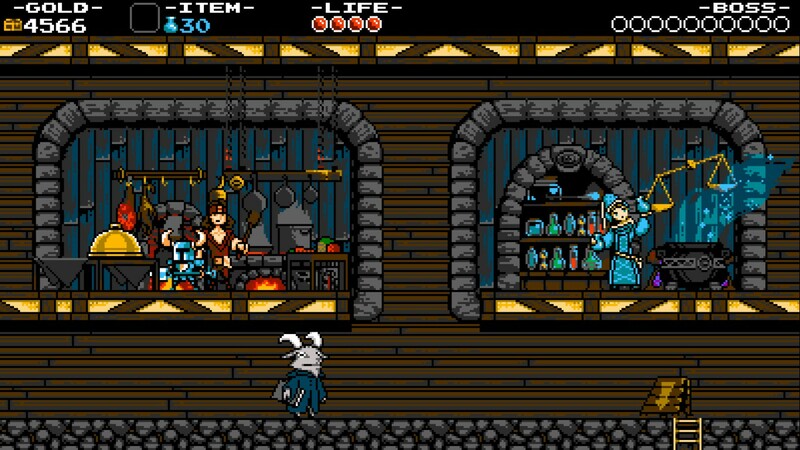 Yacht Club Games have made their debut and it has caused quite the impression on the gaming industry. Their game made with help of the Kickstarter community has reached PC/Wii U/3DS. Ladies and gentlemen, this is Shovel Knight! 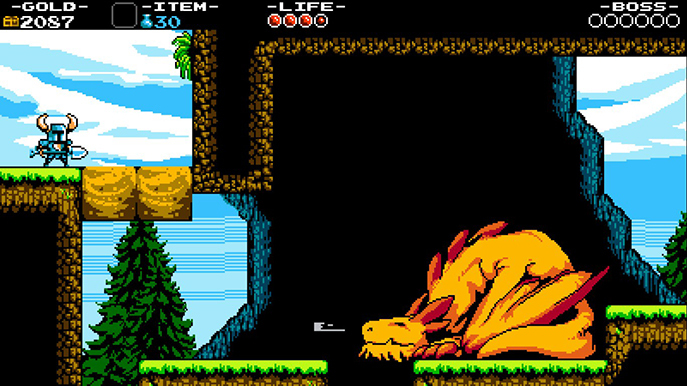 Nowadays games have been trying to please the gamer with amazing graphics, even indie developers have been trying to pull the stunt off to impress the audience, but not here, Shovel Knight brings the 8-bit style back in a metroidvania classic way. But that isn’t Shovel Knight’s only asset, because as a whole, it brings joy to every gamer’s heart to relive the retro era of gaming. Set in a medieval fantasy world, YOU are Shovel Knight, you and your amazing “weapon” will dig into trouble and tame the ground. Everything is good when you have the beautiful Shield Knight with you. As you both fight you encounter The Enchantress from the tower, separating you and loved one Shield Knight. It is now time to step up the game, pick your shovel and fight the enemy forces to rescue her! Yacht Club Games is pulling off the regular mission goal from which most Hollywood action films are based on. Save the princess! Obtain your revenge! Fight your nemesis and defeat the evil last boss! As you progress through the story, you will meet the protagonist dreaming, always having the same concept for a dream: Saving Shield Knight from falling while defeating bad guys. This obviously resembles the importance of his female companion which helps motivate the player to bring up their best game after each big mission. The story the devs created is heavily designed with the environments and the bosses each represent their “world”. It gives a nostalgic feeling from our old friend Megaman. Sniff let’s move on to gameplay! The game plays a 2D sidescroller with simple yet smooth mechanics, such as a regular frontal attack, jumping and a down attack (which is done by just jumping and holding the analog down!). As you fight enemies and jump on obstacles, you will encounter moving platforms with enemies, ledges that will bring upon your demise and many other environment mechanics defined by the level you are in. For example, fighting against the King Knight (which is quite a funny name if you think about it) is a place made out of gold, and creatures adapt to the place such as golden armored lazy griffons or flying yellow helicopter mice, you read that right. Fighting in the water world you will be submerged into action, having a different boost in jumping and landing and of course all marine biology trying to kill you. 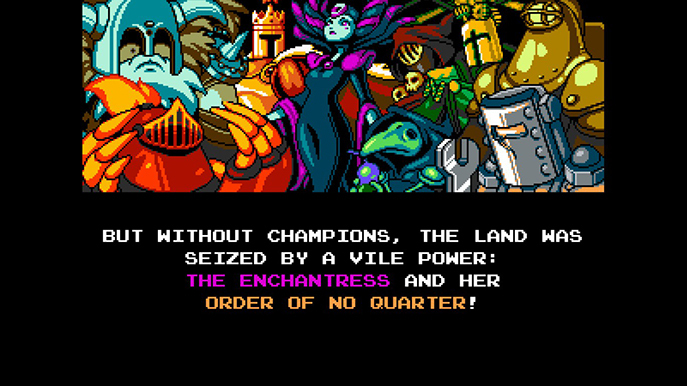 Plague Knight’s realm is like a mad alchemist’s dream, a green/dark/purple color palette filled with testing tubes and toxic bubbles, did I mention explosive rats? 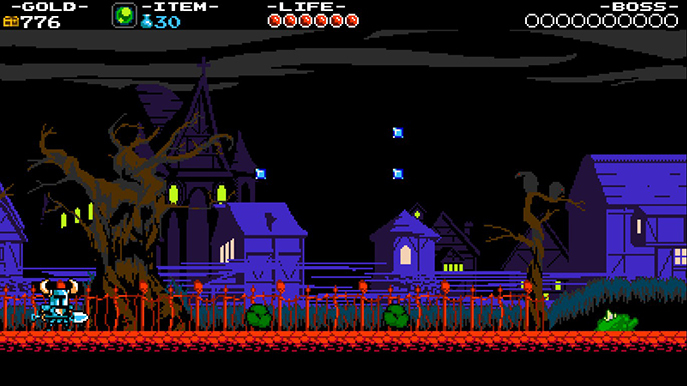 Or even one of my favorites, Spectre Knight’s world gives a whole imagery to Castlevania, where ghosts, skeleton WARRIORS and many nightmarish stuff will come by you, added with a lightning mechanic were you need to check you silhouette and try to land on moving platforms. You will also find many surprise bosses that live up to the hype. These are just some of the many interesting gameplay mechanics, each of the bosses gives the player the regular sense to learn the pattern, adapt to it, and use your tools accordingly. Many new items are given to the player as your main currency is gems, you find them scattered around blocks of dirt, enemies, chests and bosses. When you are finished with a mission, you can spend the “gold” at the town. Here you can upgrade your hit points and magic, as well as discover the many funny dialogues each NPC has! Some will also sell you special items like fishing rods that you can use on sparkling wholes during missions, fire shooting wands, bouncing green ball of destruction, etc… Remember, this is a retro game, so your curiosity is your best weapon. Hit peculiar looking tiles on walls as you can find gems or treasure, but be wary of hazardous stuff as well! The game offers to upgrade your gear as well, as you can choose different armors with good and bad traits and change of color, also 3 different special shovel attacks as another upgradable feature. Choose wisely as at first getting gold might be easy, but if you don’t concentrate on difficult platforming or learning each creature’s unique pattern, your resources will drain quickly. Moving on to graphics, the retro style gives a fresh air to the saturated catalogue of games at our current disposal. Each color palette is (as I mentioned before) adapted to its types of enemies. Sprites are very well designed, especially for Shovel Knight, her trusty Shield Knight and the rest of the main bosses, all with unique looks. The player’s HUD is fairly simple, as it should. These types of games really just need your hit points, magic, and what item you’re holding. The Boss life meter is a nice touch but I personally miss one that shows up as the boss appears and fills up 1 point at a time filling the screen, then the fight starts. Did I mention your character can jump in front of this particular info HUD? Now that’s retro nowadays. 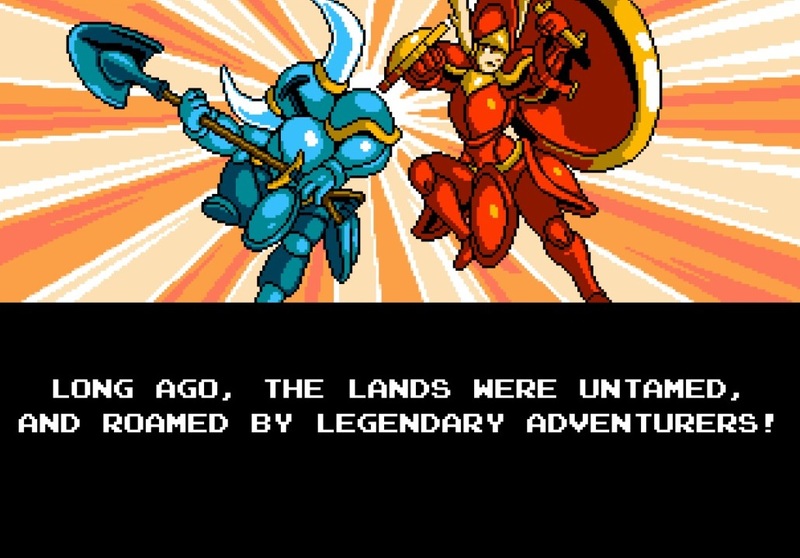 The original soundtrack’s theme is of course what you would expect from a NES action medieval game. The mechanical digital sound gives it a clear meaning of the game’s main purpose, it is a truly interesting proposal as it leaves behind real life acoustical instrumentation and adapts it perfectly. Of course each level has its own track immersing the player into the deep trouble you will be facing. As a bonus, it is only fair to share that this particular OST is available on Bandcamp with “Name your price”. Give it a listen if you haven’t as it is a pleasure. You can find it here! 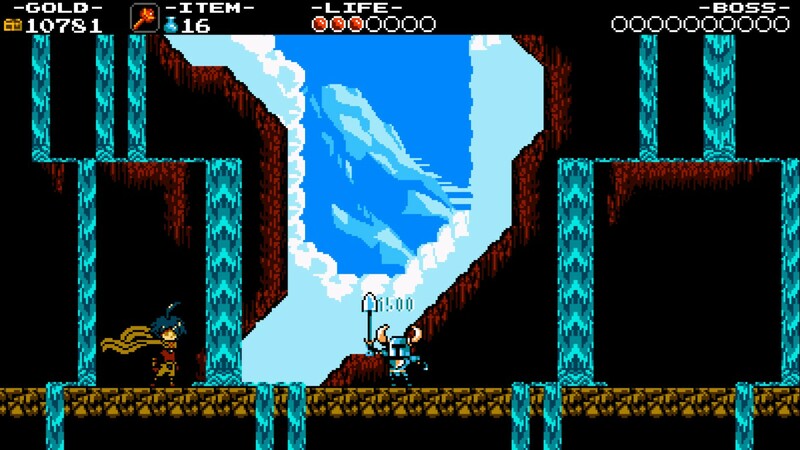 Shovel Knight is the type of game that our generation needed to make us feel like kids again, beating games from rented cartridges and having fun with your friends. This retro sidescroller will make you enjoy great visual aesthetics, phenomenal gameplay designs and an incredible soundtrack worthy of the genre. Now go save Shield Knight and take down The Enchantress, honor your title as a knight!